As of today, June 27th, I am no longer working for IBM. Last quarter’s widely-reported “resource actions” (lay-offs) hit my group and this time my number came up. 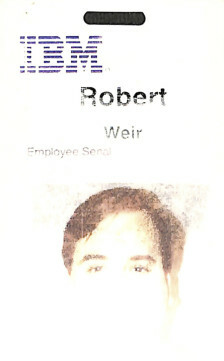 It was a good run, 27 years with one company, something that is not so common today. Fresh out of Harvard I started working at Lotus Development Corporation in Cambridge, Massachusetts, initially doing technical support, including for the Lotus 1‑2-3 C-language developer toolkit. From there I worked in support’s application development team, developing and maintaining our internal information retrieval system, a hodgepodge of a DOS user-interface, a search engine (using a Bayesian inference network) and a fax-on-demand system, all over NetBIOS. From support I transitioned over to development, to the SmartSuite team, where I first focused on Freelance Graphics, which was transitioning from C to C++, Windows and OS/2, then on a set of Windows ActiveX controls called eSuite DevPack, some Java components and attempts at an office suite running on a Java-based “thin client” or network computer (eSuite Workplace.) It was a time when the thinking, at least in my little part of the world, was that the traditional desktop applications were dead, and all future work would be done in Java running on your desktop web browser. From this came the browser wars. Then, in 1995, IBM came a knocking and bought Lotus. Our focus, naturally, shifted from desktop to server-based computing, from Java applets to Java servlets. I worked on various projects, from the K-Station Portal (based initially on Domino) to the Apache Xalan XSLT engine to XForms to WebSphere Portal. I developed a framework for document conversions within WebSphere Portal that we called Document Conversion Services (DCS). Then, one day, I got an odd call, out of the blue, a very senior person asking whether I was familiar with the file formats from SmartSuite and Microsoft Office. Evidently, no one else in the company would admit to having that arcane knowledge. So, I was drafted onto a “special project,” with a few other talented engineers, a real fun group working on various stealthy tasks, the details of which I am still not at liberty to discuss. Somewhat overlapping the above, I worked on the things that readers of this blog will be more familiar with, the development of the OpenDocument Format (ODF) standard at OASIS and ISO, and the arguments against ISO ratification of Microsoft’s Office Open XML (OOXML) file format. This then overlapped, in part, with my work to establish the OpenOffice project at Apache, based on Oracle’s contribution, to get IBM Symphony contributed as well, and to bring those two efforts together. Those years were among the most memorable of my career. I was able to work with a lot of talented and enthusiastic people, within IBM, of course, but also at other companies, with non-profits, with academia and government. I was able travel and see parts of the world I might never have otherwise seen, speak to a lot of audiences about the importance of open standards. I even testified to a few legislative committees. My business travels took me to Brussels, Berlin, Budapest, Barcelona, Granada, London, Paris, Lyon, Rome, Orvietto, Geneva, Amsterdam, the Hague, Beijing, Seoul and Johannesburg. It was a lot of hard work, but it was meaningful. Open standards and open source matter. I have many fond memories of those years. Eventually, however, corporate interest in document editors, document standards, “social documents” and similar initiatives fizzled, and I no longer had support for remaining involved in ODF and OpenOffice. I needed to move on, to find a new gig. I looked internally within IBM for something that would combine my hard technical skills and my soft skills, including working closely with attorneys, an ability to “meet them half way” when discussing complicated legal/technical topics. Since I’ve been an active inventor throughout my IBM career, with 54 patents to my name, and a good head for reading and analyzing patents, I spent a few years working as a patent engineer, helping to monetize IBM’s vast patent portfolio, developing technical evidence for infringement, identifying possibilities for patent licencing and assignment, etc. That’s where things stood as of today, when I handed in my badge and laptop. As for what is next, I honestly cannot yet say what “Rob 2.0” will be. I plan on taking some time to mull things over and explore my options. One thing I do plan to do, relatively soon, is start a new blog, a fresh start, on a new path at this domain, preserving this older blog at its current (/blog) URL.